Folklorists and scholars typically consider folklore according to genre and community. Genre refers to the various forms folklore takes, categorized as "oral," "customary," and "material." Oral folklore includes naming, speech, narration, and music. Customary folklore involves traditional actions or behaviors using particular techniques, such as gathering for a festival or acting on a traditional belief. Material folklore consists of the tangible objects that comprise the folk culture of a group, including folk crafts, arts, architecture, and foods. Folk communities may also be characterized by ethnic and geographic factors. The different histories and lifestyles of communities in the Mountains, the Piedmont, and the Coastal Plain of North Carolina gave rise to different folkways. Likewise, ethnic groups created and continue to maintain distinctive folk traditions. Native American, English, German, and Scotch-Irish groups all contributed items of folklore that became part of the general folklore of North Carolina while remaining identified with the original ethnic groups. African Americans brought foodways and musical styles adopted by many North Carolinians of different backgrounds, and recent immigrants such as Latinos and Southeast Asians continue to contribute new facets to North Carolina's diverse folk culture. Folklore associated with a particular occupation often arises when people work closely together. Tobacco cultivation and processing exemplifies occupational folk culture in North Carolina. Traditions associated with farming, harvesting, grading, marketing, and processing tobacco pass from one generation to the next; for example, the tobacco auctioneer's style is perfected by listening to and imitating other, more experienced auctioneers. Thus North Carolina possesses a highly symbiotic folklife-trading and advancing traditions by intermingling various folk backgrounds. Although one locale is generally as rich in folklore as any other, North Carolina has been particularly fortunate to maintain a strong awareness of its folk heritage for many years. The North Carolina Folklore Society is one of the oldest state folklore societies in the country. In 1912 folklorist John A. Lomax, then president of the American Folklore Society, implored folklorists across the country to create state organizations bringing the activities of collecting and preserving American folklore to the local level where they might be more effective. Answering this call, Frank C. Brown of Trinity College (later Duke University) organized the North Carolina Folklore Society. Eighty-five charter members attended its first meeting, held on 24 Mar. 1913, in the North Carolina General Assembly Senate chamber. The North Carolina Folklore Society worked toward its twin goals of collecting and publishing the state's folklore with the creation of a publishing committee in 1915. Over the next 30 years, Brown continued to amass material but repeatedly delayed its publication. When Brown died in 1943, Newman I. White of Duke University was named general editor of the forthcoming publication. White worked on the mammoth project of sorting Brown's collection, housed in the Duke University archives. Upon White's death in 1948, new general editor Paul F. Baum led the project to fruition. The first three volumes of The Frank C. Brown Collection of North Carolina Folklore were published in 1952, and other volumes followed in 1957, 1961, 1962, and 1964. This collection, representing the textually oriented scholarship of its time, is the most comprehensive published collection of folklore from any state in the nation and serves as a benchmark and standard reference work for other collections as well as a rich source for continuing research. In addition to issuing publications, the North Carolina Folklore Society holds annual meetings combining presentation of folk arts, current scholarship on North Carolina folklore by society members, and organizational business. Meetings were held in Raleigh until 1986, when members decided to convene at various sites throughout the state, usually at a college or an organization involved with folklore. The society initiated a Community Traditions Award in 1992, recognizing organizations and groups contributing to the continuation and appreciation of the state's folklife. "Ears that hear not," c.1914. 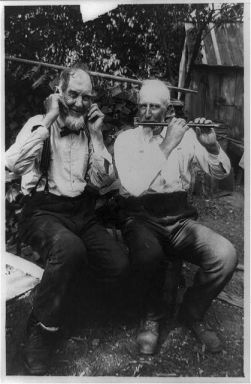 Image courtesy of the Library of Congress, call #: SSF - Musical instruments--Flutes <item> [P&P]. Available from http://www.loc.gov/pictures/item/91481301/ (accessed May 29, 2012). I appreciate your website and have a question: what is a good source (book, journal article, or other) for information on the traditions and folklore surrounding the NC tobacco culture? Thanks for visiting us. We're glad NCpedia is helpful for you! By separate email, I am going to connect you with reference services at the Government & Heritage Library (State Library of NC). And one of the staff will contact you to assist you with locating resources.